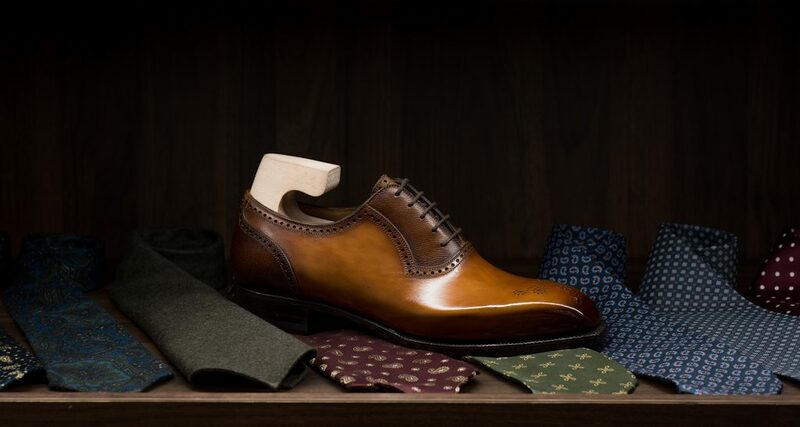 Now based in Napoli, Antonio Meccariello’s familly is originally from a small town near Benevento, the region was known for having been during the 1950’s an important hub for shoemaking. Many specialized small workshops frequently homebased, were at that time flourishing in the area. 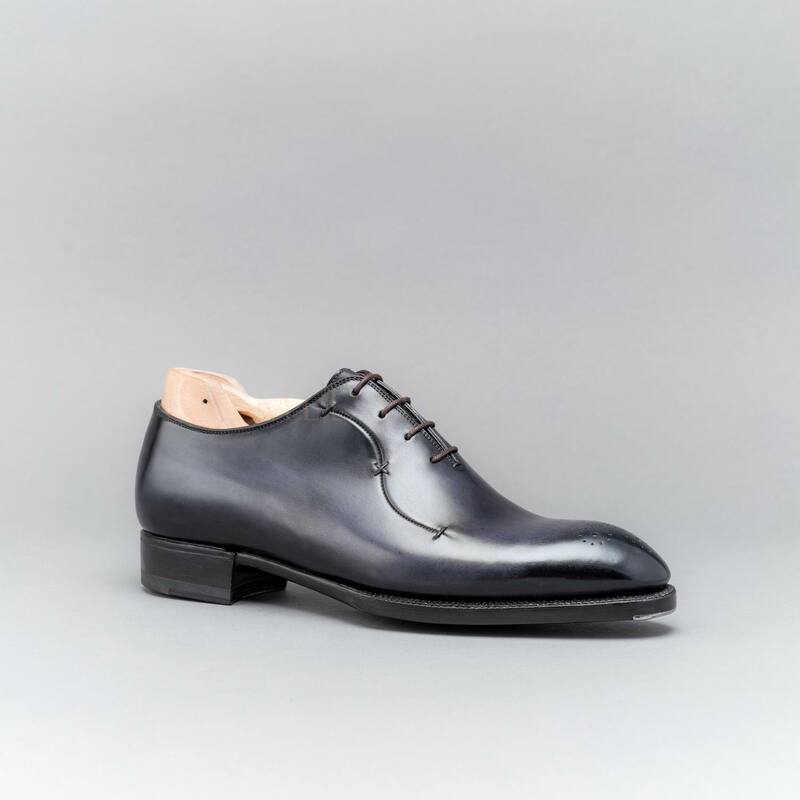 Thus, Antonio learned from his grandfather who practiced as a bespoke shoemaker and his parents who together started a small-scaled factory specialized in cutting and stitching the uppers. The factory soon came into being acclaimed to French and Italian designers thanks to the precision and quality of their work. Concerned about his lineage, Antonio studied shoemaking and trained as an apprentice in Milan. Antonio, then came back to his home town attentive to study further the many unrevealed secrets of Neapolitan shoemaking. After establishing his own workshop in Benevento purveying bespoke shoes, his footwear encountered an absolute success among Neapolitan’s Elite and dandies. Gentlemen such as Mariano Rubinacci, Ciro Paone and Antonio de Matte (from Kiton) later asked him to help for the introduction of a Ready to Wear line. We, at Medallion now present both Antonio Titanus line specially developed for Medallion with special, sleek and elegant lasts featuring incredible patinas, and the Aurum line made to the same extent as bespoke. Medallion has sorted out a selection of models from Antonio Meccariello’s collection, all made in his workshop in Napoli. Our first model is a classic pair of Adelaide Oxford with a plain front and Medallion on Toe. The shoe has been made on the Chiselled last. The pair has been made with a rich Whiskey stained smooth Calf Leather with on quarters a contrasting discreet light pine grain Calf Leather that add a subtle texture to the model. The pair features an elegant angular punched stitching Adelaide pattern as well as a one-piece counter. The Chisel structured last, the refined tapered heels and the bevelled waist are some of the details you would find on this pair that make it so special. Our second model is a tribute to Full-Brogue Oxford. Antonio Meccariello played to revisit the classic Austerity Brogue with a stitched Ram Horn Medallion on Toe Cap and three perforations. Not only innovative by its design, the model is also outstanding by its patina. The pair has been stained in a Coffee Brown on Toecap, quarters and counters while the rest of the upper has been coloured in a Navy-Blue. The Coffee Brown incorporates a hint of yellow that match the Navy Blue. Although the patina with the contrasting colours might look unexpected, the result is a unique and delicate piece of footwear. 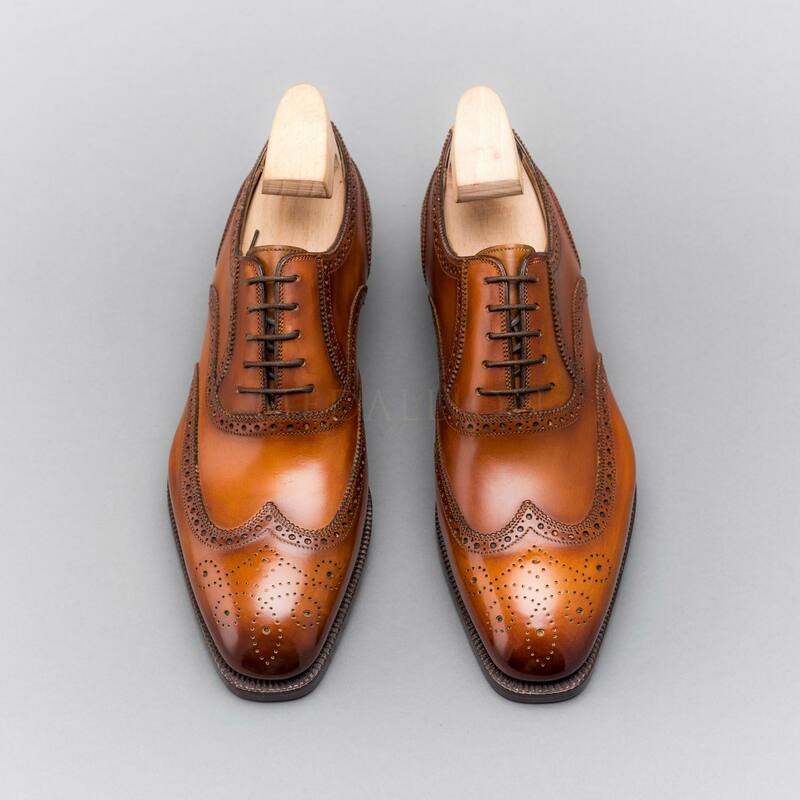 The Austerity Brogue is supposed to have made its first appearance during the Second World War in Europe. While the troops were fighting on the battlefield, the population not called for war was living scantily. In order to reduce the amount of leather needed to produce a pair of shoes, bootmakers invented the Austerity brogue. Nowadays, wearing an Austerity Brogue as those is of an understated charm. 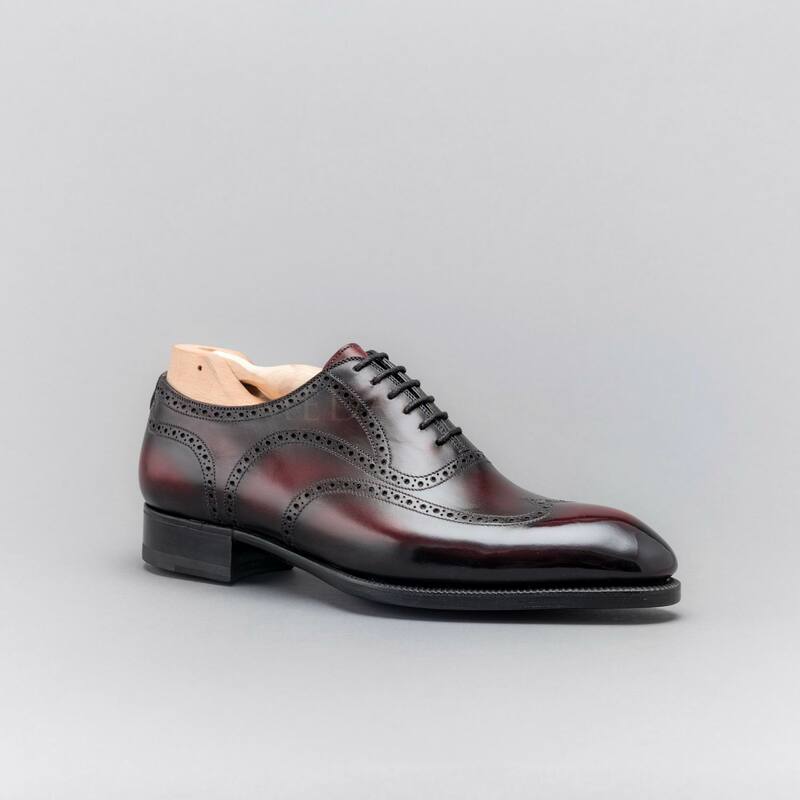 The third model we would like to introduce is a marvellous Blind Brogue. A Blind Brogue is a pair made in only one piece of leather featuring a Full Brogue pattern on the upper. This style of footwear is interesting as a Full-Brogue pattern sometimes could appear too bulky because of the superposition of layers of leather or because of the gimped lines. 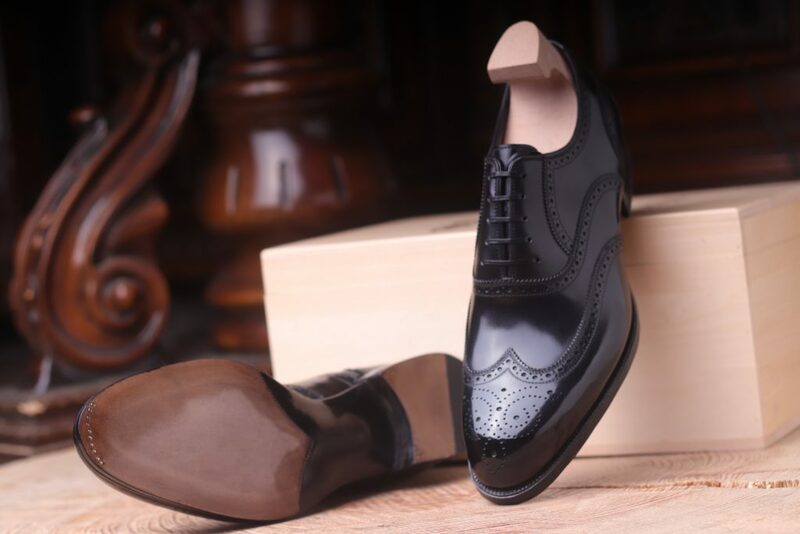 However, the Blind Brogue offer a clean design while being lavishly ornamented. 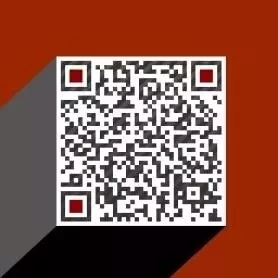 When purchasing clothing and footwear, we always recommend our customers to seek for something versatile, and the rich Burgundy Patina will be a marvellous match not only with your Navy and charcoal suits but also your Blue denim or flannel pants. Our fourth model is a light Whisky Smooth Calf Leather Full Brogue Oxford, the model features gimped lines that adds some texture to the model. Besides, thanks to the light shade of the Patina not only the details of the pattern are even more visible but also you can fully enjoy the quality of the leather, the long process of tanning resulting in an oily texture. Our fifth model is certainly one of the most outstanding piece. 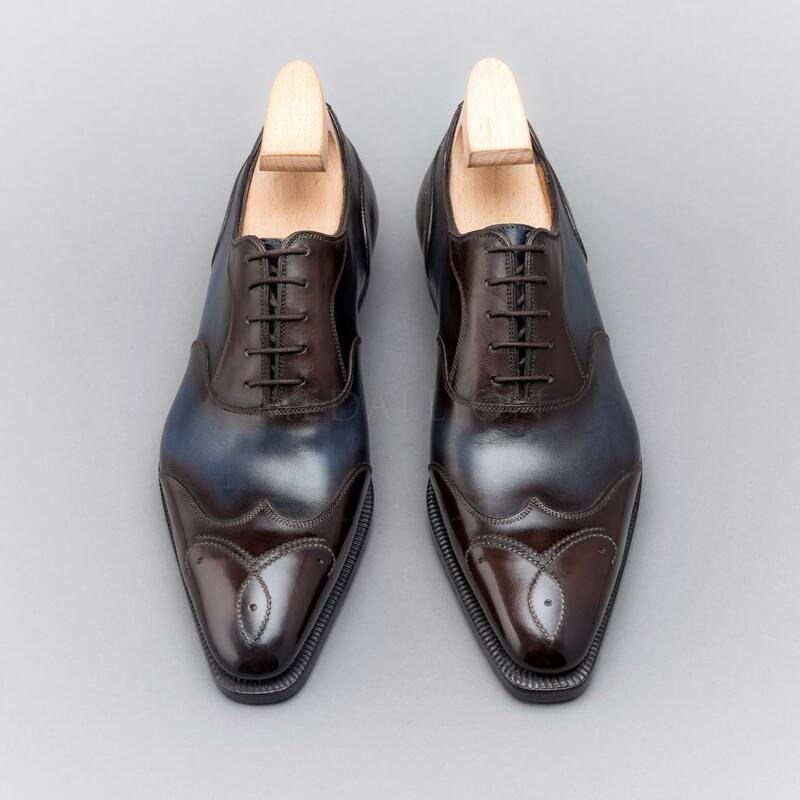 First each shoe has been made in a single piece of leather, that would have been carefully selected by Antonio. Those curved hand seams don’t have any functional utility but beauty. Only the hand of a highly skilled craftsmen can incorporate such detail in a creation. The S curved stitching and the medallion on Cap Toe adds a unique feel to this pair. Finally, the last model we would like to introduce is our Adelaide Oxford. The Adelaide Oxford is a classic style that never goes out of style. Perfect for gentlemen seeking a formal pair of footwear but who already have too many Classic Cap Toe Oxford in their Wardrobe. 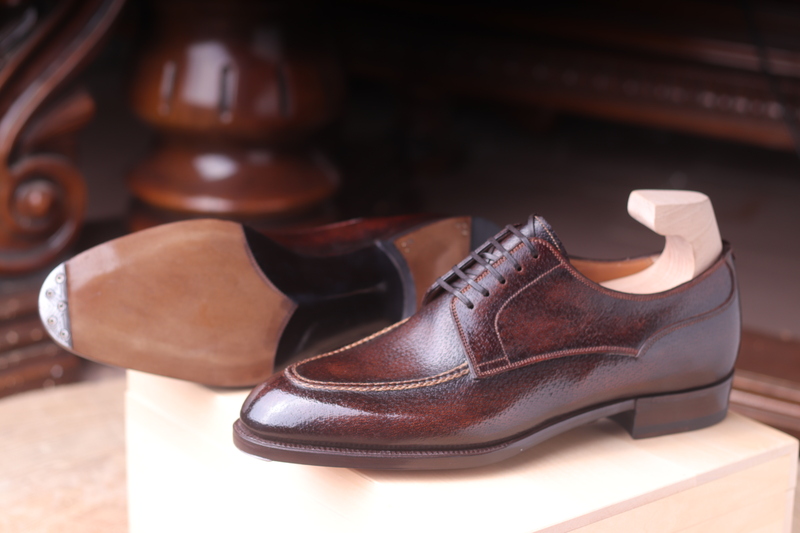 With its Almond toe shape and Dark Brown patina, this model is of classic elegance.